A copy of the final site plan for 236 townhouses the Douglass Township Supervisors will shortly vote on approving. A long-discussed housing development located on 285 acres south of the former Zern's Market in Gilbertsville seems to be nearing the finish line. 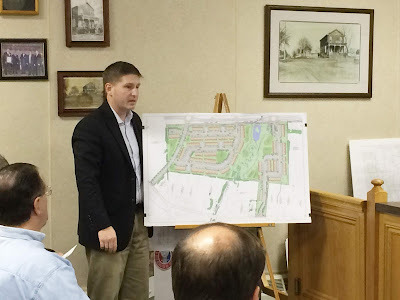 Last night the township supervisors voted unanimously to authorize Township Solicitor Robert Brant to draw up a resolution giving final approval to the project. Engineer Jason Smeland outlines the final plan for the Zern tract. 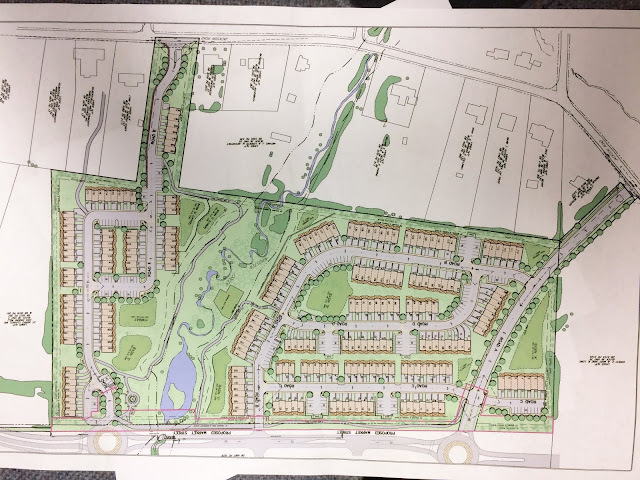 Known as “the Zern tract,” the Danny Jake Corp. has been proposing a development of one kind or another on the acreage between Jackson Road and Route 100 for six to eight years, said Township Manager Peter Hiryak. It was more than a year ago that the supervisors granted the project preliminary site plan approval. At the time, it proposed 240 townhomes. 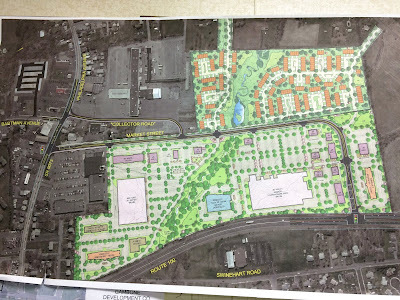 "It's been through some changes since then," said Jason Smeland, from the Chalfont firm of Lenape Valley Engineering, who presented the plan recommended by the township's planning agency to the supervisors Monday night. Smeland said once final approval is received, construction could begin in the spring and will move forward in three phases, but may take several years to complete. "It depends on how well it sells," he said. 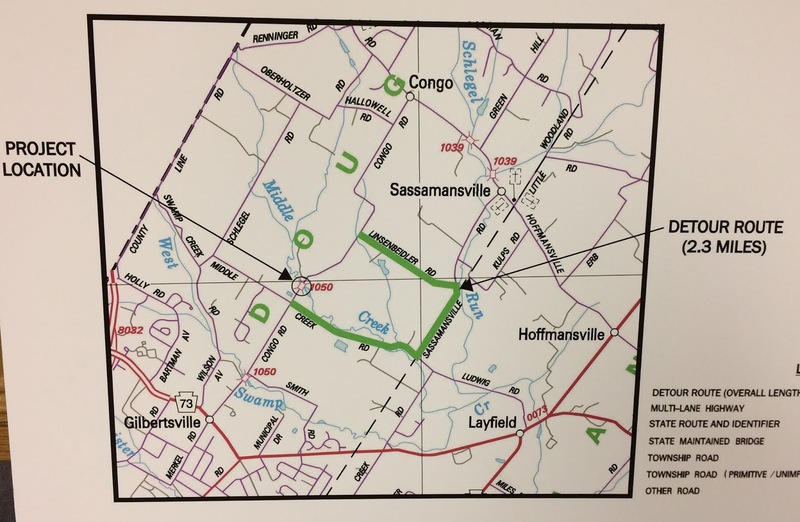 The project is a key part of a long-planned proposal to build another road in Douglass parallel to Route 100 and Jackson Road and this project will contribute $329,293.02 toward that project, as well as some land easements for the construction, Smeland said. Route 100. The "L" shaped road is the proposed Market Street. 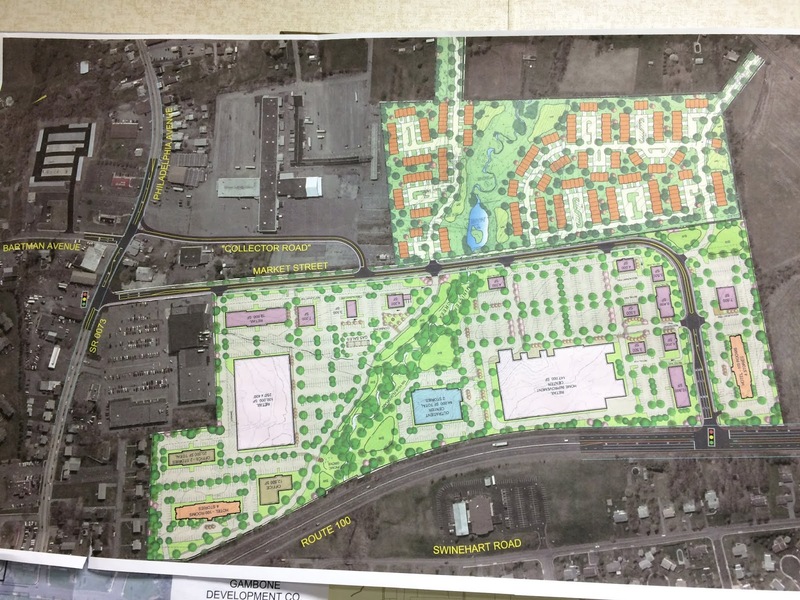 That parallel road is called Market Street and will not be constructed until a much larger commercial development along Route 100 and owned by the Gambone development family comes to pass. As proposed now, that project includes two four-story hotels of 100 rooms each; a 147,000 home improvement store, a 64,000 square-foot outpatient facility; another 100,000 square feet of retail and several smaller office buildings. Hiryak, who said that project is "years away" from fruition, said the new Market Street will provide access to that project, as well as the Zern tract development, directly off Route 100. He said in order to allow access to Route 100, complete with a traffic signal, PennDOT will require the Gambones to align Market Street with Bartman Avenue at the intersection with East Philadelphia Avenue, thus creating an safer intersection and requiring the demolishing of Doc Watson's Irish Pub, which the Gambones own. 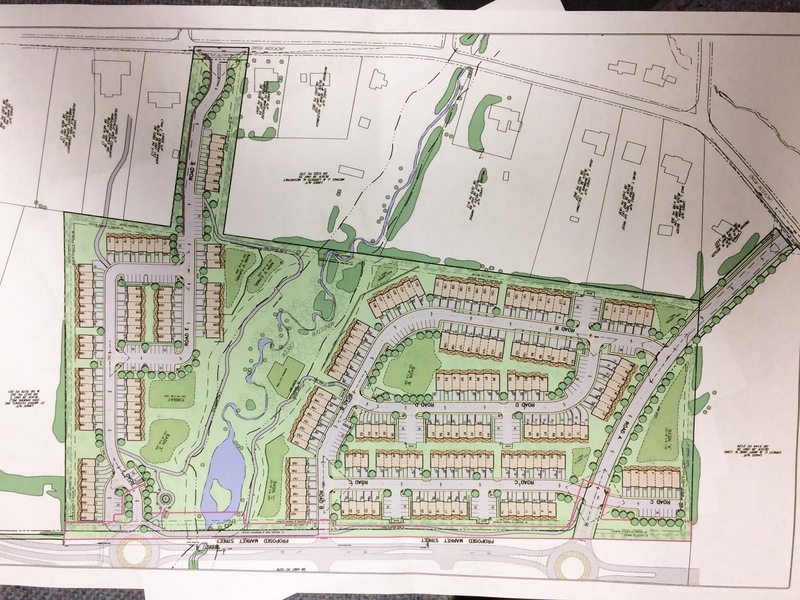 In a related note, Hiryak told the supervisors the owners of Long property along Jackson Road and Route 100 will speak to the township planning agency on Thursday, Feb. 14 at 6 p.m. about plans for preserving open space there. "It should be pretty interesting," he said. Construction on the Paper Mill Road bridge has been delayed by cold weather, Hiryak reporter to the supervisors Monday night. Originally planned for completion on Jan. 15, Hiryak said it now looks like it may not be done until March or early April. Now owned by the county, which is paying for the construction, when it is complete the township will take over ownership of that bridge. The same is true for the Henry Road bridge, which is now in the design phase for repairs. Construction is expected to begin at the end of this year. A map of the Congo Road bridge detour as outlined by PennDOT. Next year, into 2021, PennDOT will replace the Congo Road bridge over Middle Creek, just north of Middle Creek Road, said Hiryak. 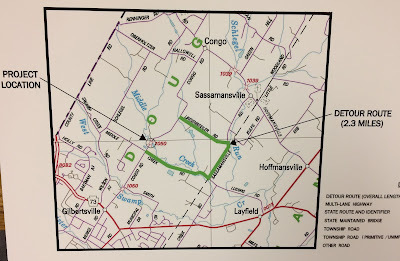 When that happens, that portion of the road will be closed and a 2.3-mile detour along Middle Creek Road, Sassamansville Road and Linsenbeidler Road will be instituted, Hiryak said. When that project is completed, ownership of the bridge will transfer from the state to the township, said Hiryak. Hiryak said since he has no exact dates, he does not know how that will line up with some other road closures due this year and next in New Hanover. 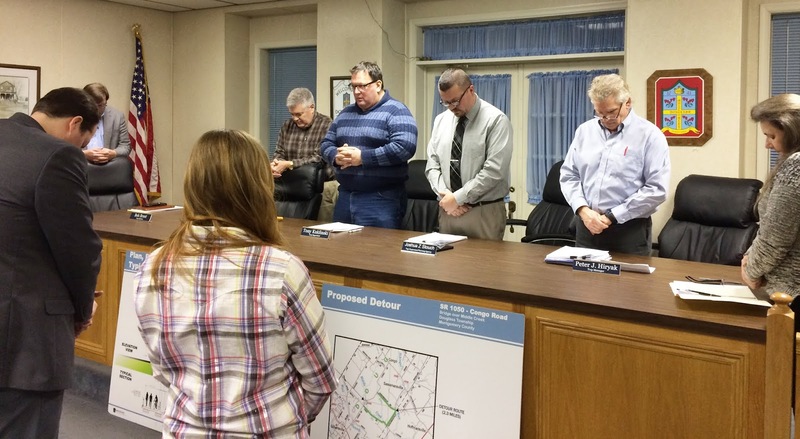 Last March, New Hanover reviewed preliminary plans to replace a bridge on Swamp Pike and another on North Charlotte Street in 2019 and 2020 that will have both roads closed for up to 12 weeks while they are replaced by construction crews. The second bridge project on the docket take North Charlotte Street, or Route 663 if you prefer, over a tributary on Minister Creek just north of the intersection with Swamp Pike. to mark the passing of former supervisor Tim Turner. The supervisors began last night's meeting by marking the passing of former Township Supervisor Timothy Turner and observing a moment of silence in his memory. And with that, here are the Tweets, what few there were, from the meeting. Dude, I moved from Phila. To a beautiful home on swamp pike two years ago. In those two years it has occurred to me that Gilbertsville has become another Phila. complete with more houses, more disgusting loud traffic not to mention the influx of people. Needless to say, when I purchased my house I thought I was leaving the city not moving into one.I can't wait to sell my home and go down south. Keep your taxes and disfuctional board members. Bye.